In the fast-paced digital world, customer expectations have hit an all-time high! Today’s hyper-connected customers experience intuitive, relevant and seamless digital interactions across a broad spectrum of brands and they expect the same from you. Customer-driven Digital Transformation is one of the key differentiators and companies are constantly re-innovating and reimagining themselves to deliver superior brand experiences. And with the rise of convergence of SMAC (Social, Mobile, Analytics, Cloud) technologies, companies realize that deploying an efficient Digital Transformation strategy is no longer an option; it is imperative. The good news is that there are significant opportunities to embrace digital realities to become transformed enterprises. However, it is critical that you have a holistic and effective strategy and clearly defined business goals to maximize the return on your Digital investments. In this blog, we will discuss some of Digital Transformation strategy best practices that will enable you to transform Customer Experiences (CX) and accelerate digital success. A dedicated Digital Transformation strategy team is essential as people involved in other operational roles in addition to their DX initiatives will not have sufficient bandwidth to fully commit themselves to the time and mental rigger that your Digital Transformation strategy requires. It is also critical that the team has the right mix of people, including those who understand the company’s business processes and experience in implementing the needed types of business changes required to assure DX success. It is great if some or all people with these skills may be found within the organization. However, if not, external sources need to be brought in to assure that you have the right skills, knowledge and the right mix of people. Your Digital Transformation strategy success largely depends on your ability to create value for your customers. So, you need to focus on how you can segment your core capabilities and realign them to deliver the outcomes that your customers desire, rather than selling them the products or services you have traditionally sold. For this, you need to use data and analytics to create new insights that can help your customers. By constructing a web of services and business capabilities to adapt to the changing customer expectations, you can take your Digital Transformation strategy to the next level. Digital Transformation funds can positively or negatively have a significant impact on the chances of success in a DX initiative. Though organizations look forward to Digital initiatives to transform businesses, IT budgets aren’t necessarily increasing, but resources for Digital efforts come from “self-funding,” according to a Gartner report. Dedicated funding is essential because DX is a long-term investment and not a short-term operational expense. Moreover, allocating separate funds illustrates to those working on DX initiatives and the company at large, the value and importance of your Digital Transformation strategy and initiative to the Senior Management. Moreover, it is recommended that IT decision makers take a seat at the leadership table to discuss the long-term tech investment that enables the organization to make headway on Digital Transformation strategy. The metrics for success related to the “Business Why” discussed at the beginning of the journey, needs to be tracked and communicated across the organization. This will ensure that you stay focused, learn and rise above new business challenges, and validate the approach you are taking. One of the key methodologies to track Digital Transformation strategy efforts is digital KPIs. This can help an organization ascertain the progress level of its Digital Transformation strategy and how far it is improving its digital business outcomes. Bains & Company’s recent survey of 1000 companies from across the globe to measure their level of digital readiness revealed two significant facts: The payoff from Digital Transformation can be impressively high, however, the success rate is regrettably low. Often, companies miss the fact that technology used to implement Digital Transformation is only one aspect of DX and it is the strategy beyond technology that drives Digital Transformation success. A methodical and reasoned approach to your DX initiative enables you to mitigate possible risks, better serve customers and drive profitable revenue. Also, organizations that have a holistic approach and look at Digital Transformation as a huge growth driver, a game changer and one that offers a world of opportunities are the winners in this game. To find out more about accelerating change and driving a successful Digital Transformation strategy, Talk to our experts at PreludeSys! Great article,The information that are provided in this article are really impressive. 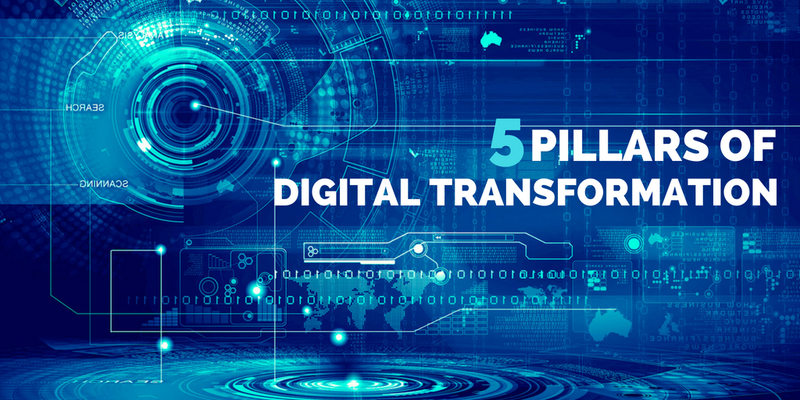 Nice information about Pillars of Digital Transformation Strategy that are given in this article.